alliance4action is sponsoring training on gathering valid signatures for such Petitions on June 5 at 3:30 pm at Casa Community Services (opposite Posada Java). This session is open to the general public. Saturday, June 3, 1:30 p.m. The alliance4action Election of Progressive Candidates Action Group invites you to a meeting to introduce Dr. Mary Matiella who is a potential candidate for the CD2 seat now held by Martha McSally. Dr. Matiella will speak on why she is considering becoming a candidate, her qualifications and how she believes she could win the CD2 seat. There will be time for questions and answers. Other potential candidates will be introduced over the next weeks. Members of a4a are invited. We also invite DCSRA members to attend. H.R. 2431 would criminalize unlawful presence in the U.S. and require state and local law enforcement to redirect their limited resources toward immigration enforcement, among other provisions. According to the Cato Institute, “The Michael Davis, Jr. and Danny Oliver in Honor of State and Local Law Enforcement Act (H.R. 2431) purports to empower states and localities to take action against serious criminals who have violated immigration law. In reality, the bill is a vehicle for a massive expansion of the federal government and of federal power over states and their citizens. alliance4action will be offering the occasional “Pop-Up” meeting, usually for about one hour, on an issue of interest to watch for and keep on the radar for possible future action. We firmly believe that an educated constituency is vital for a democracy. An ARTICLE V Constitutional Convention has been proposed by 29 of the 34 states required, and will be further promoted/discussed this summer in Texas. Except for 1787, when luminaries such as Adams, Hamilton, Madison, Jefferson, et. al. decided to throw out the Articles of Confederation and created our U.S. Constitution, there have been no Constitutional Conventions. Do we have such great minds as these that we trust today to tinker with our Constitution, with the power to throw it out, and re-write the whole document? The Koch Brothers are promoting this, while the John Birch Society opposes the idea of a Constitutional Convention. Come and find out more. Presenter: Maureen Brooks, a retired lawyer who specialized in civil litigation and estate planning as a member of the California and New York State Bar Associations, heads up the a4a Writers Group. She was an adjunct professor at Marist College in their ABA accredited Paralegal Program from 1993-2012 when she retired to Green Valley. She has led many OLLI courses and presents at the Live from the Met in HD at our local movie theater. Jeff Latas, a potential Democratic candidate for the CD2 seat to oppose Martha McSally, will be in Green Valley this Tuesday, May 23, at 2:00 P.M. He will tell us why he is seriously exploring a run for this Congressional Seat and what he has to offer as a candidate. You are invited to come meet him and hear him speak. His presentation will be followed by a question-and-answer time. It will be an opportunity for our community to share our issues and concerns with him. Snyder, a Yale historian, warns, “Americans today are no wiser than the Europeans who saw democracy yield to fascism, Nazism or Communism in the 20th century.” He offers political advice ranging from straightforward (“Defend institutions”) to insightful (“Be calm when the unthinkable arrives”). Laurie Jurs will moderate the discussion. It is a short book, only 128 pages. Please read it beforehand for a deeper discussion. The alliance4action (a4a) formed, organically—and quickly—after the November 2016 presidential election and has been active ever since. On May 3rd, about forty a4a activists met for two hours to consider our first 100 days! Begin to determine future directions, group and individual priorities. Here’s what we heard from many of you. We plan an on-line survey to the broader group later this summer and hope all will participate so we can get more input. There is general agreement that participants are happy with a4a now, that we should keep up the good work, that we should remain flexible to address concerns as they come up, and keep active and visible in creative ways. Be welcoming/friendly; get to know one another. Socialize. Celebrate our successes and congratulate ourselves. All a4a issues: Continue to encourage members to contact our MoCs. Find new, creative ways to advocate and educate. Teach everyone how to register to vote. Engage community with door-to-door canvassing and other education. Design speaking opportunities and fundraisers. Include focus on millennials and Independents. Consider high school students, teachers, school board members. Do more formal outreach, marketing and publicity: our goals and successes should be known. Form technology/social media group to support outreach efforts: editorials, public service announcements, raise money with other groups for TV and radio ads. Speakers Bureau (drawn from Action Groups, leadership and general membership). Tee shirts, tri-fold posters, colorful handouts/FAQ sheets. Provide training in action groups re: outreach. Continue to get the word out about Action Group issues to the media to not make the President’s actions seem NORMAL. Keep snowbirds active and engaged over the summer: contact MoCs in each home state; get reports from them. Consider a Human Rights groups that would include: Women, LGBTQ, Race and Immigration. Don’t grow too big too fast: quality over quantity. Don’t burn out! Learn how to sustain our energy and effectiveness: self-care (action groups and a4a in general). Celebrating 100 Days of Resistance, May 3: Approximately 40 a4a’ers met to review our first 100 days. The focus group was facilitated by Anne Towne, a professional from Washington D.C. (a friend of Diane Meyer’s), and we spent time discussing what has gone well and what we need to improve on. Notes from that meeting will be shared in the next couple of weeks. Activists’ Buffet, Meeting with cih!, May 7: A full house at Casa heard from State Senator Andrea Dalessandro about the almost complete legislative session in Phoenix. Then we split up to learn new skills: letter writing, calling, Resistbot, Facebook, and writing postcards. Outreach: Fred Ginocchio reports that the a4a table complete with banner was a success at the Wednesday Farmer’s Market. The season is over but will resume in the fall. We have started to reach out to neighboring Indivisible groups including Indivisible – Southern Arizona and Indivisible – Cochise County. If you are interested, we suggest you join their Facebook groups, lots of action and comments there. There are now 7000 Indivisible groups nationwide and they seem to be gaining steam. Now that you are at your summer residences we hope you are taking time to breathe, relax and reflect on what happened the past four months in Green Valley! You were, and still are, a critical part of creating and growing the alliance4action (a4a), a truly historic achievement! As we continue to learn and organize it occurred to us that you are now a terrific new resource. Since you are scattered all over the U.S. we thought you might want to have some fun and be our summer eyes and ears. We could learn so much from you and your wanderings. If you should choose to do so please send us brief observations about political actions in your areas: attractive events, effective actions, unique protests, potential speakers, in general any insights or thoughts which might help us become more effective in our organizing efforts. So send us your emails. Send them to Fred Ginocchio at fredgin13@gmail.com. He will collect the news from our “winter friends” and publish them in Flashes this summer. Looking forward to hearing from all of you with your experiences and insights. Rally – Show Us Your Taxes! Our April 15 rally at the corner of LaCanada and Esperanza was another success with great press coverage from the Green Valley News. We estimate that 200-250 folks were there. Tune Us In: Ann Striker and Laurie Jurs will talk about a4a on Bill Buckmaster’s radio show on KVOI AM 1030 on Monday, May 22 at 12:30. 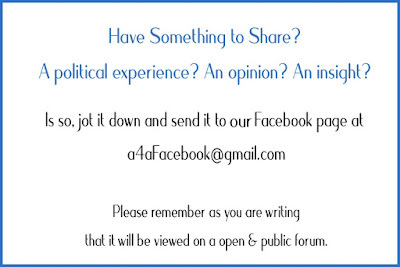 This group is designed to assist those wishing to write Letters to the Editor or Opinion pieces. Bring your ideas, rough drafts, etc. and we’ll help with them. Next meeting: Adjourned until fall. 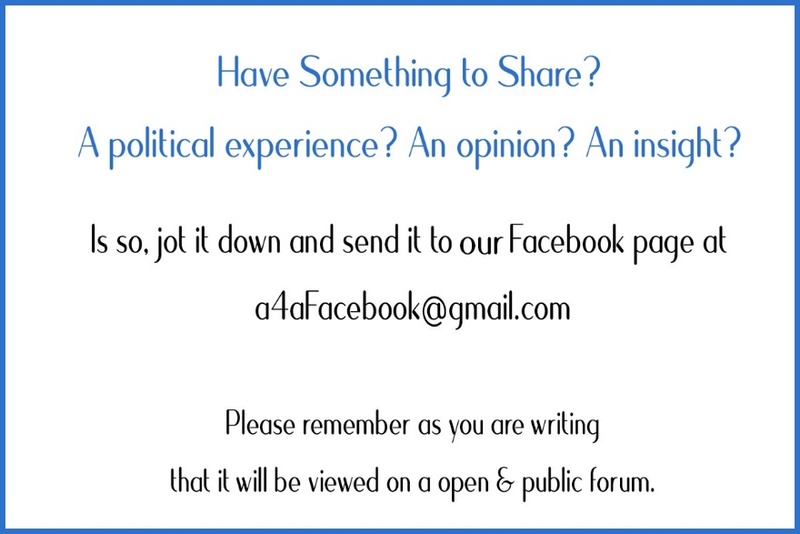 Contact Maureen if you would like feedback. Reviewed the Berliner presentation on April 13. Reviews were great and we had good coverage from the Green Valley News. Developed a plan to work with our two school districts on adopting the Arizona School Board Resolution to oppose further expansion of Student Empowerment Scholarships as defined in HR 1431. We will use the public speaking time at each meeting to urge the board to make that resolution. If both boards adopt, we will send a letter to the paper as well as the Arizona School Board Association in support of their resolutions. Sahuarita adopted April 27. On May 8 six members of the Education Committee attended the meeting of the Continental school board and gave testimony in support of public education and urged them to adopt the Arizona School Board Association Resolution to oppose ESA expansion. After discussion, the final vote was 1 in favor, 3 opposed, and 1 abstained. After the meeting we tried to understand the rationale of those who were opposed. The only conclusion we could reach was that they really didn't understand the issues. It was discouraging because things had gone so smoothly in Sahuarita. We have a lot of work to do here in Green Valley! Sent postcards (Arizona pictures) to Congresswoman McSally urging opposition to HR610 and HR 899. Next Meeting: Monday May 15 at 4:00 P.M. at Cayley Cakes. To advocate pharmaceutical pricing reform in the U.S. health care system (under discussion). We had letters to the editor and columns published and participated in the Tax Day Rally. Four members went to Senator Flake’s Tucson office on April 17th to tele-conference with Helen Heiden, Legislative Staff in Washington D.C.
Continue to meet during the summer months; support other resistance groups; daily contact with our MoCs; continuing research on prioritized healthcare issues; continue trainings as requested i.e. Twitter; build capacity regarding the group’s work, actions and commitments. Visit with Senator Flake’s staff. Voiced objection to his anti-environment votes, lack of support for the Clean Power Plan and undermining of the EPA. Asked that he use his position on Energy Committee to promote alternative energy sources to protect the health and safety of our nation and the planet. Participated in Rally for Science and the People’s Climate March in Tucson. Called MOCs about the “Scientific Integrity Act”, protecting the EPA and proposed rollback of the “Methane Waste Rule on public lands”. Contacted AZ legislature using “Call to Speak” on environmental legislation in AZ. Will inform alliance members how to make official public comments to EPA re the administration’s plans for deregulation . Send out Call-to-Action Alerts on climate change issues over the summer. Next Meeting: The Climate Action Group will resume meeting in October. LTE volunteer Kathy Stocker re: expansion of detention beds, new prison approved for near Houston. Maureen Brooks informed us of new writer's group to polish LTEs and opinion pieces. Interim chief of BP has refused to sign an ongoing agreement with the No More Deaths camp in Arivaca (recognized as a Humanitarian Aid station by the International Red Cross). ICE will not honor DACA cards and will pull holders in for criminal checks and possible deportation. Decision to fashion a member survey of the team – location, actions you do or want to do, best meeting times, etc. Susie Sanders will create the survey. We discussed where to go with these, and decided to work together carefully to refine them and post on our a4a Racial Justice tab on the website. This will help us internalize the information and thoughts, so that we will be to speak clearly and confidently about the issues to individuals and groups. Following Senate Bill 573, which calls for the creation of a National Criminal Justice Commission. It would work for 18 months to review every aspect of the nation's criminal justice system, from policing to prosecution to prisons, and then issue a set of proposed reforms for not only federal but state and tribal systems. Discuss and refine two position papers: Black Lives Matter, and Prisons in America. Determine a logo for Racial Justice group. Hear from one of our members about developing a power point for our position papers. Discuss the idea of a summer book group. Postcards were sent regarding the removal of LGBTQ persons from federal surveys. Contacts were made to MoCs promoting pro-LGBTQ bills. We established a list of organizations to watch for legislative information regarding LGBTQ persons. There was a presentation on LGBTQ advocacy through the arts April 23 at The Good Shepherd Church. We will begin to work at the state level on non-discrimination policies. Group members will work on this during the summer in the location of their summer residence. • EPA regulations are intended to protect us and our children. The new EPA focus is on short-term financial gains for some rather than long-term health and safety benefits for all. This makes it harder to achieve healthy air for all and is not what our government should be doing. • Administrator Scott Pruitt wants states to take over the job of the EPA. The problem with this is that states can’t confine air and waters to within their own boundaries. We need national standards and regulation. • The American Lung Association “State of the Air 2017” report states that “The Clean Air Act prevents tens of thousands of asthma attacks, heart attacks, strokes, and premature deaths each year.” “One-quarter fewer people now live where the air quality hit unhealthy levels compared to the 2016 report, which covered data from 2012-2014. The greatest improvements come from continued progress in reducing pollution from power plants and transportation sources, which contributes to high ozone days and year-round particle pollution.” We must keep and improve upon the gains of the Clean Air Act. Die-In beginning at 5:00 P.M. at Congresswoman McSally’s office. These Die-Ins are occurring all across our state. We need to let our MoC’s know we care about the health of our friends and neighbors even if they don’t. Feel free to dress in bandages and bring crutches and canes. If you want to carpool, come to the East Center at 4:00 P.M. and park at the north end of the parking lot. Demonstration from 4:00-6:00 P.M. at Senator Flake's office. 6840 N. Oracle Drive, Unit 150, Tucson. The purpose of the demonstration at Sen. Flake’s office is to protest any relaxing of the hiring standards for Border Patrol agents. We will meet at Cayley Cakes at 2:45 P.M. to carpool. We will try to stop off at the McSally Die-In on our way back. On Thursday, May 4th, Trump signed an Executive Order limiting the impact of the Johnson Act of 1954 which prohibits religious and other tax-exempt organizations from participating in political activities. As a result, religious organizations are freer to engage in political activity, and by implication, it provides particular safety for those who wish to withhold contraception from employees. Although this executive order did not go as far as the one leaked earlier in the year that would have allowed federal agencies to discriminate against LGBT persons in their employ, it carves a path for denial of rights based on freedom of religious expression. Under the LGBTQ tab on the a4a website: alliance4action.org please see a complete list of actions you can take to grow support for equal rights for all. Twitter. . . create your Twitter account in advance so that you are ready to send a tweet. We will create a mini-tweet storm together. • Please bring forkless treats or snacks to share for a social time at the end. HB2086, a bill to prohibit cities and towns from issuing ID cards, has passed the House and Senate GOV Committee and is before the Senate Rules Committee. Contact the following Senators on the Rules Committee ASAP; ask them to vote "NO" on HB2086! Citizens who lack driver's licenses or other government ID need these ID's to purchase bus tickets, get a library card and other services. The penalty is too harsh. It withholds and re-distributes to other towns, cities, counties,water fund and the state general fund ALL tax money that belongs to the violating city.